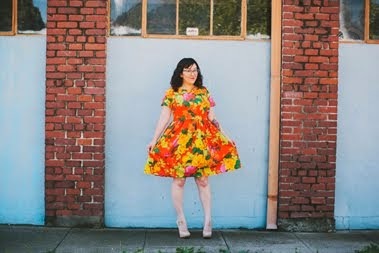 Sara over at Sew Sweetness is hosting a Dress Up Party and asked me to contribute. 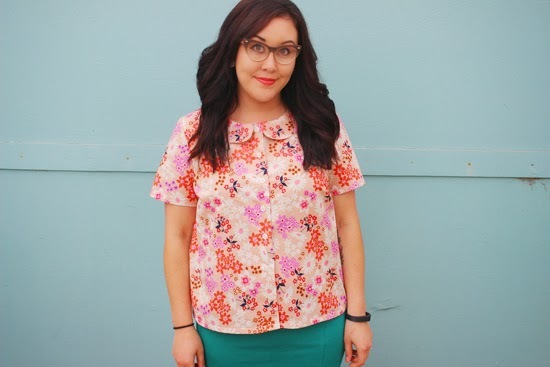 I chose to make the Colette Patterns Violet blouse in a Cotton and Steel fabric. To sum up the changes I had to make for the pattern: I went down a size, went down an additional size at the shoulders, extended the dart by an inch, and did a FBA. To read my review, see more photos, are hear some Mad Men talk, please check out Sara's blog. Cute top! It's very Mad Men-ish. While the cut is Betty Draper, the fabric is Megan. I wish the finale didn't spend so much time on Don finding himself, but I loved how all the storyline's ended, especially how Peggy's story wrapped up (I almost started crying it was so cute). I agree about Peggy! It was nice to see her being happy, which you didn't see very often on the show. I had been hoping for a while that the two of them would end up together! I love that Peggy and Stan got together, even though I thought it was a little out of character for the show. I LOVE that Joan gave those sexist jerks at McCann a piece of her mind and started her own business! I was disappointed with Don's ending though. I wanted some sort of closure that in retrospect could only have been achieved if he died. Even if it meant a hokey flash forward to a heavily made-up Jon Hamm, I wanted to see the end of Don Draper's life. I do think the finale was appropriate in that it seems he did what he always does - freaks out, goes on an irresponsible journey that somehow inspires him, then channels that inspiration into a popular ad of some sort. I just wanted more closure. Such pretty fabric. (My first thought at the end was 'namaste b!tches"). I was quite sad for Sally and I was really drawn into those calls he made to Sally, Betty and Peggy. I haven't watched ANY of Mad Men, I didn't think I would cope with the rampant misogyny, even though I know it's "historically accurate"
I love this shirt! It's so cute! I really liked the finale, actually, although I really wanted to see a final Don & Sally scene. But it was a really satisfying finale and those are so rare! But now what do we watch????? Great fabric. I like the ensemble too. Lovely.